My setup is quite simple, an Ocata all-in-one deployment with compute KVM. The OpenStack infrastructure was deployed with Kolla. The deployment method is not important here, but Magnum and Heat need to be deployed alongside other OpenStack services such as Nova or Neutron. To do this, enable those two services form /etc/kolla/global.yml file. If you are using Devstack, here is a local.conf that is deploying Heat and Magnum. The Kubernetes cluster will consist of 1 master node and 2 minion nodes. I’m going to use Fedora atomic images for VMs. One useful info is that I used a 1 CPU, 2GB of RAM and 7GB disk flavor for the VMs. Below are the commands used to create the necessary environment setup. Please make sure to change IPs and different configurations to suit your environment. The deployment status can be checked and viewed from Horizon. There are two places where this can be done, first one in Container Infra -> Clusters tab and second in Orchestration -> Staks tab. This is because Magnum relies on Heat templates to deploy the user defined resources. I find the the Stacks option better because it allows the user to see all the resources and events involved in the process. If something goes wrong, the issue can easily be identified by a red mark. [root@kubemaster ~]# kubectl cluster-info Kubernetes master is running at http://localhost:8080 KubeUI is running at http://localhost:8080/api/v1/proxy/namespaces/kube-system/services/kube-ui To further debug and diagnose cluster problems, use 'kubectl cluster-info dump'. So there it is, a fully functioning Kubernetes cluster with 1 master and 2 minion nodes. Kubernetes networking is not the easiest thing to explaing but I’ll do my best to do the essentials. After an app is deployed, the user will need to access it from outside the Kubernetes Cluster. This is done with Services. To achive this, on each minion node there is a kube-proxy service running that will allow the Service to do its job. 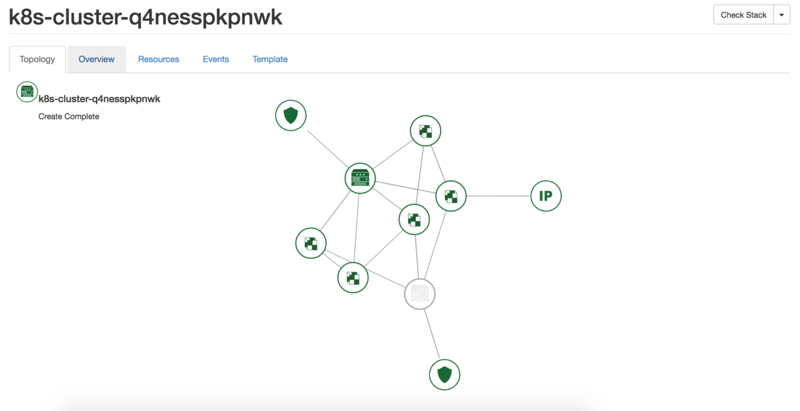 Now the service can work in multiple ways, some of them are via an VIP LoadBalancer IP provided by the cloud underneath K8S, or with port-forward on the minion node IP. Now that all is set up, an app can be deployed. I am going to install WordPress with Helm. Helm is the package manager for Kubernetes. It installs applications with charts, which are basically apps definitions written in yaml. Here are documentation on how to install Helm. I am going to install WordPress. There are multiple ways of accessing the contents of a pod. I am going to port-forward 8080 port from the master node to the 80 port of the pod. Kubernetes on OpenStack is not only possible, it can also be easy!